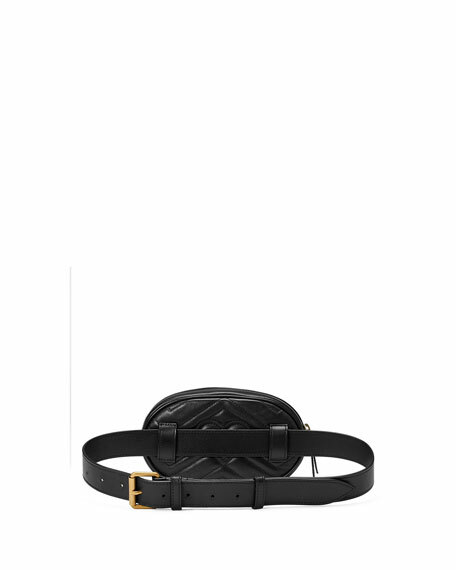 Gucci matelassé chevron leather belt bag. May also be carried crossbody style. Interior, leather lining; one slip pocket. 4.5"H x 7"W x 2"D.
Gucci pebbled leather mini shoulder bag with palladium-tone hardware. Curb-chain shoulder strap can be doubled, 13-23.5" drop. Flap top with crystal tiger head spur. Pin closure with side release. Flap pocket under flap. Microfiber lining. 5.8"H x 8"W x 1.8"D. "Dionysus" is made in Italy.